I always knew I’d move to Hollywood and do... something here. I didn’t have the courage to move for years, not because I was afraid my dreams would be dashed, but afraid that my dreams would come true. They have, they will, they are still. I put it off for as long as I could and then I told myself I would visit for only four days, flopping on a friend of a friends couch in the deepest corner of the Valley – nowhere near Hollywood. I imagined a Get-Shorty-like world filled with colorful and dangerous characters and I found just that. Colorful and wonderful characters in real life, but whose goal it was not to be a gangster for real but to play one in a movie or maybe to write that movie someday. The Los Angeles I know is the one of the movies, the picture business, and those who think like I do respect the past of this city while at the same time are trying to make the next big thing. Or at least be a part of the next big thing to be. 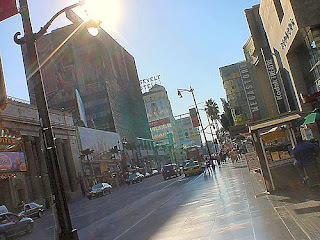 My four day exploratory (I called it a recon) to Hollywood has since lasted thirteen wonderful years as of this month. In that time I’ve gone from an angry youngster with $500 in their pocket, a half-formulated dream and some talent, to a person who has traveled the world and seen and done things others merely read about in magazines. And I’ve been lucky enough to see my name up on the screen a few times too. My reward for making that leap of faith years ago is not one of financial wealth, as of yet, but the prize I now hold dear is that I am now a person who's life in hindsight, and currently, inspires me like no movie ever has. It inspires me to continue to do great things and has reminded me of all those reasons I came here so long ago. I wish you great luck in all your endeavors here in this magical and difficult place. May that wonderful and scary energy that comes from the creative drive be with you all your years here. Hurray for Hollywood!